The first two games in the Police Quest series, while certainly enjoyable in their own ways, seemed to be struggling to find their place. Through a combination of meager writing and some failed ideas, they never entirely attained the goal of being either an entertaining police drama, or a realistic police simulator. 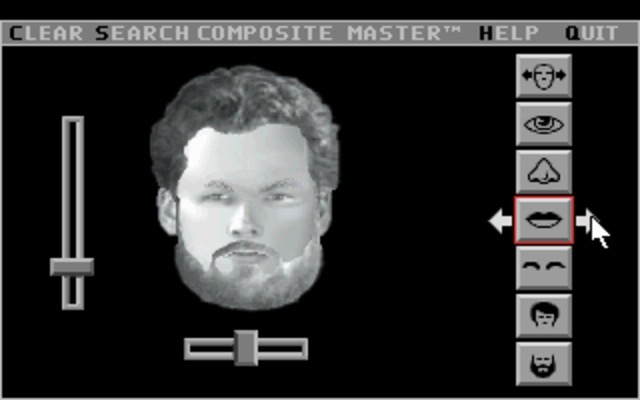 They were basically average adventure games, unique only in the fact that they allowed you to play as a police officer. 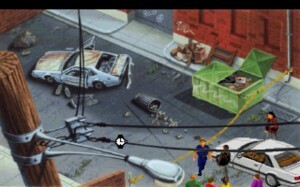 Police Quest 3 finally overcomes most of these hindrances and comes out as a plausible police game, and an enjoyable adventure. PQ3 is the final chapter for both Jim Walls and his character Sonny Bonds, and fittingly takes the best elements of the first two games and makes a new adventure based on improved versions of both. You’ll start off as a newly-promoted Sergeant Detective back in street blues on traffic patrol, but this time with officers to supervise. It’s a nice way for Sierra to take a second swing as some of the things they did wrong with the patrol sections of the first, while still feeling unique. You’ll quickly be moved back to Homicide, as a rash of serial murders start popping up around the city. Unlike PQ2, you will actually be working on crime scenes and making deductions, instead of cleaning up Jessie Bains’ mess. I hesitate to call it the best in the series before I play the fourth, but it’s unquestionably the best so far. At least the killer was considerate enough to dispose of the body in the provided dumpster. Keep Lytton clean! If you’ve played the original’s VGA remake, the controls and style will look very familiar. Many art assets, like the cars, inventory items, and Sonny’s character sprites, are reused across both games. Backgrounds are of the same hand-painted style, with a couple of strange angles, but scads of detail. There are also enough new locations that it doesn’t feel as if PQ1 VGA was simply thrown together using pieces from this game. Both games share the same style, and both games clearly take place in the same concept of Lytton, but you’ll be checking out different areas in each. Digital photographs of actors are used as the basis of all characters and character animation, but PQ3 also takes it a step further by using occasional digital images for entire scenes and character close-ups. Jim Walls himself donned his street uniform and hiked a leg up on top of a patrol car bumper for the introduction, ending, and game over screens. They even animated his mouth, with sometimes chuckle-worthy results, but it is rather neat to have the designer of the game “talking” to you about the story. The text parser is dropped for a point and click interface, though the feeling of being “led” through the game is significantly reduced. Part of this comes from a better interaction between intended procedure and the interface. In the previous two, you would often know what you were expected to do, but have a difficult time figuring out how to relay that. The obvious example is trying to figure out the correct wording in the parser, but there were also times when you wanted to “look under bed,” but you weren’t standing on the “proper” side of the bed to do so. Most of this is now handled automatically, and the game frequently gives you the benefit of common sense. There are also very few pixel hunts in the game, streamlining the experience, and focusing the “procedure” on more fun aspects. As with the second, there are fewer moments when not working “by the book” will get you killed. The vehicle inspections are removed altogether, you don’t have to shower between clothing changes, and the only thing that really gets you killed is approaching a car on the driver’s side while on the freeway. I couldn’t understand why this mattered enough to have me repeatedly minced by a passing motorist, and Walls’ “a smart cop doesn’t approach the car from the driver’s side” chiding didn’t make any sense. Cops approach from the driver’s side all the time, and talk to you through your window to get your registration. Then I finally understood that since I was on the freeway, I was supposed to walk around the car and approach the driver from the front, so that I could see the oncoming traffic. Either that triggered a global revelation that made me never have a similar problem again, or that’s simply the only point where confusion meets death. Also nice is that all the procedure you learned in the previous two games pretty much carries over to the third, so I was already putting my handgun in the jail locker before entry, and looking up felony codes for the booking process. The only thing that does not return is the neccessity of keeping dispatch aware of your situation. You no longer have a radio extender, and your radio mike in the car cannot be used, so you will never ever call dispatch, even when it seems like a hell of a good idea. Instead, you and your partner cowboy up and roll right into danger without backup, or anyone knowing where you are. 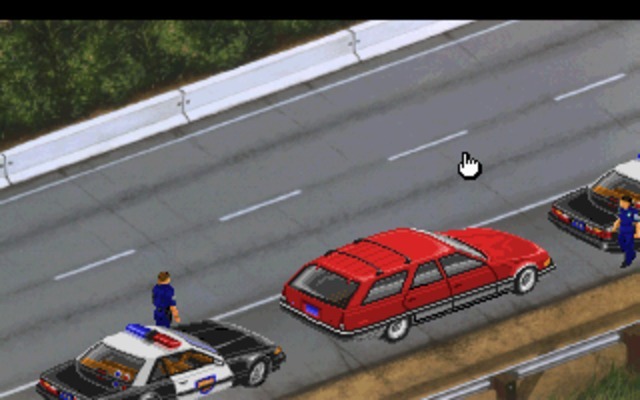 If you were a fan of PQ1, you’ll be delighted to know that there are more, and more varied, traffic stops in this game. If you were a fan of PQ2, you’ll really appreciate the greater feeling of solving a mystery and being a detective in the second section. One of my biggest complaints with the previous game was that you weren’t actually solving anything. By tossing out Bains and giving you a brand-new case, you come in not knowing what to expect, and not knowing precisely how the game will turn out. There were a few legitimate surprises along the way, and some unexpected twists (along with a few very expected twists), but overall it’s great storytelling and a great mystery to solve. To be fair, there are some plot holes, such as why the department would promote a traffic cop with a history of attitude reprimands and destroying evidence. But again being fair, it worked out as a suitable B-plot, and I really wanted to know what she was up to. This is not as consistently good, but I don’t say this lightly – I haven’t had this much fun with an investigation since Snatcher. As soon as that gets reviewed, you’ll see what I mean. Another smart way they combined the ease of the point-and-click system and the “I did that!” of the text parser are the high-tech gadgets the department now has. Similar to another “work is fun” game – Spycraft – you’ll be using technology and convenient programs to assist you in your investigation. While previously you would have a ticket book and a pen in your inventory and type “write ticket,” you now take the license of the motorist back to your car, feed it into a dashboard computer, input the 24-hour time of the offense and the felony code, print out a ticket and take it back. The major difference is that by using the computers to ask you questions, it makes sure you’ve been paying attention, and is an easy check to make sure you know the correct procedure. It also makes learning all those procedures worth something, and rewards a sharp detective eye. It’s not all computer-based, and there will still be plenty of footwork, but I never had a problem working the machines. The combination of collecting the evidence in the field, and processing some of it back at the office, really felt like I was affecting and making progress in my case. You will, of course, want to bring a notepad to reference all the various case files, phone numbers, and whatnot. The case numbers are particularly important, as there is no way to search through them in the computer (you must know the number to access it), and all evidence must be booked under the appropriate case to be processed. The kid gloves are again put on, as it is hard to miss anything absolutely crucial to advance the plot. Most side aspects only result in points. Frequently it comes down to finding the evidence yourself and getting the points, or having another character find it and give you the item, but with no points. Otherwise, the same outcome will happen regardless of your action, or that action simply won’t get done if it’s really not required, both resulting in missed points for you. There are two side plots, and since I’ve already talked about one I won’t disclose the other, but your handling of those two plots result in extra points, as well as directly affecting the ending. You’ll always track down the source of the murders if you finish the game, but the “happiness” of the total ending relies on how much time you devoted to the side plots. Sound is vastly improved over PQ1 and 2, taking advantage of the new technology. The effects are on par with the PQ1 remake, while the music is not. Jan Hammer (Miami Vice) composed this one, with Robert Atesalp on effects. The main theme is pretty squelchy on Adlib/Sound Blaster, and actually sounds like the instrument assignments are off (they’re not). The music for the “tender” scenes is great, but the action themes aren’t terribly intense, and the driving ones approach heinous. It seems apparent this one was composed for the Roland MT-32, and then ported to Adlib. You can hear the difference. Adlib’s not great here, but it is at least better than the nothing soundtrack from the previous games. The effects are noticeably reused among this game and the PQ1 remake, with identical background noises (typing, phones, wind and such), tire squeals, gunshots, and enough others that someone could probably make a list. Since Atesalp worked on both, and they are all fairly good anyway, I suppose this shouldn’t be a surprise. I did say “driving section,” didn’t I? It has, sadly, returned. It has improved over PQ1, as accidents with other cars are completely removed, and navigation is far easier. You can only actually crash by driving “off the map.” Upcoming street signs and landmarks appear in front of the car as road signs, with fair warning before their arrival. Your speed is also no longer limited, and you can floor it to 100 MPH without penalty. Unfortunately, it is still a step below the interface in PQ1 VGA. You have no overhead map at all, so you must follow along with the one in the manual. You can turn on a tracking unit mounted on your dash to get a very crude map of your general location, but you will still need the paper one to get street names and locations. Not all places have parking lots, so you frequently are expected to stop “outside” the location and get out of the car there. This is often a little confusing, but if you stop in the same block as the reported address, you’re usually okay. Controlling the car relies on moving your mouse within a driving window on the right. Moving to the top of the screen and clicking increases your speed, moving to the bottom and clicking applies the brakes. Left and right make turns when applicable, and your speed gets artificially limited anyway by having turns blaze right by before you can react, if you’re going too fast. You also can’t turn at all if you’re going over 50. This results in having to creep the car down to 30 or so and wait for the one-second window you have in which you can turn. Stops also return, but these are manual, and force you to brake your car to a halt before you reach the line. If you overshoot, you suffer a penalty of five points. 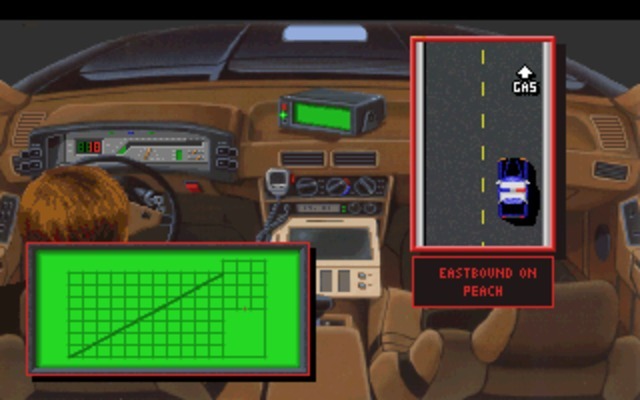 I suppose if you’re doing traffic patrol, then the manual driving has to return, but it still doesn’t have the bugs worked out, and still is more of a hindrance than any fun. I’ve had the most fun of the series so far out of this game, and the closest it has come to the claim of being a police simulator. Walls’ experience shows with his influence on the game, and you can tell this has more authenticity than a handful of programmers trying to “guess” what real cops do. It’s also a testament to the refinement of Walls’ skill as a storyteller. Certain aspects of the story could fall into stereotype or forced drama, but they don’t. The game could ram procedure down your throat to the point that it’s more like taking a test than playing a game, but it doesn’t. The game could be a hammy retread of a typical Hollywood-style plot that you don’t care about, but it isn’t. Instead, it’s a very satisfying, realistic-feeling investigative thriller, with a story worth telling and seeing through to its resolution. The series might have been even-better received if this were its first outing, but it clearly took the others to get here, and it is a satisfying example of the progression they have made. Fantastic graphical look over the EGA versions, better realizations of the traffic sections of PQ1 and the homicide sections of PQ2. Fresh story and enough interactivity to keep you hooked. Average music. An improved, but still not very good, driving interface.